The Rochester Knighthawks did the U.S. Military proud on Saturday night with an 18-13 win over the Buffalo Bandits at Blue Cross Arena. The rivalry between the Knighthawks and Bandits is no different than traditional sports clashes between Army and Navy. During Military Night, the Knighthawks represented the Navy on their jerseys while the Bandits represented the Army. 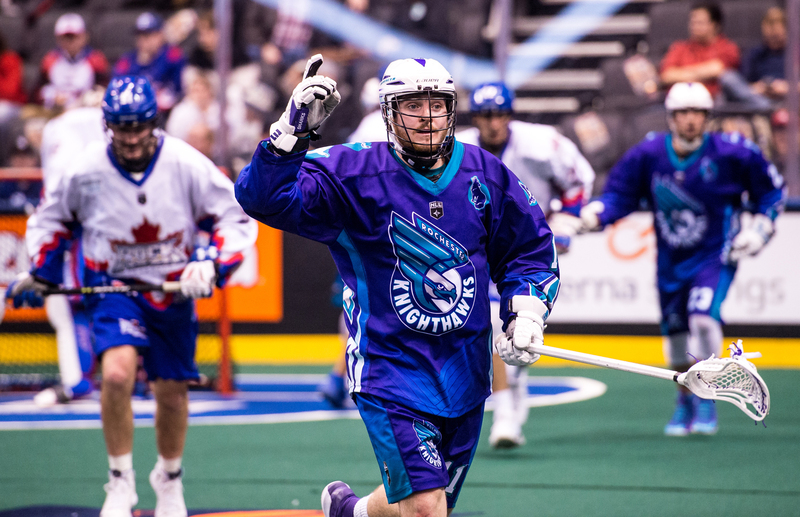 Austin Shanks led the Knighthawks with seven goals while Angus Goodleaf made 43 saves. The Knighthawks led just 3:29 into the game and never trailed en route to a beatdown of their closest rivals. Though a five-goal difference isn’t large in lacrosse, and the Bandits proved themselves pesky late, the Knighthawks win never seemed in doubt. They appeared stronger and more determined than the team who lost 13-4 to the Bandits back on January 5th. Rochester led 4-2 after the first. They increased that lead to 9-6 at halftime during a penalty-filled second period. Already up 8-6 late, the Knighthawks pulled Goodleaf to allow Cody Jamieson to score with four seconds left. On the ensuing faceoff, Jake Withers’ helmet was knocked off as he was slashed by fellow Peterborough native Bryce Sweeting, drawing blood near his eye and a scrum as everyone on the floor rushed in. Minor penalties washed out as Joe Resetarits, Luc Magnan, Justin Martin and Mitch deSnoo all went to the box for roughing. Sweeting was hit with a major. Sweeting found himself back in the box late in the third quarter for another slash. Rochester, who went 3/6 on the power play, converted on both opportunities with Sweeting in the box. They also scored two shorthanded goals on one penalty kill in the fourth. Buffalo was also 3/6 on the power play with one shorty. The teams combined for 68 penalty minutes throughout the game. In the fourth, Shawn Evans drew the ire of Paul Dawson after the referee separated Evans and Scott Campbell. Dawson took exception to Evans’ attempt to punch Campbell behind the ref so he took Evans down to the turf. The penalties didn’t end there as Ian Llord ended up on top of Nick Weiss late in the game while Steve Priolo and Mike Burke also wandered into the fray. Knighthawks’ rookie Cam Milligan, in his second NLL game, said the rough stuff was inevitable considering how close the two teams are. He, along with Withers, Llord, Vitarelli and coach Mike Hasen won the Canadian senior championship together this past summer – along with eight members of the Bandits. They all want to win at this level, too. In addition to the rough stuff, the fourth quarter was highlighted by two career milestones – Pat Saunders scored the 150th goal of his career while Milligan scored the first of his. Milligan’s foot was in the crease during an earlier attempt by Saunders so it was fitting that both were redeemed later in the game. Buffalo scored three in a row to end the game but the damage was done. The Knighthawks improve to 2-3 while the Bandits fall to 4-2. Shanks’ 7G/1A led the Knighthawks, who also got big efforts from Joe Resetarits (3G/4A) and captain Scott Campbell (2G/1A). Kyle Jackson contributed a goal and four assists while Cody Jamieson had a goal and five assists. Grame Hossack, Cory Vitarelli and Pat Saunders all had 1G/2A. Thomas Hoggarth led the Bandits with a hat trick. Corey Small added two goals and three assists. Mitch deSnoo was the only other Bandit with a multi-goal game. Shawn Evans had a goal and four assists. Matt Vinc was pulled in favour of Zach Higgins after Rochester’s 13th goal. The rivals meet again on February 22nd back at Blue Cross Arena.